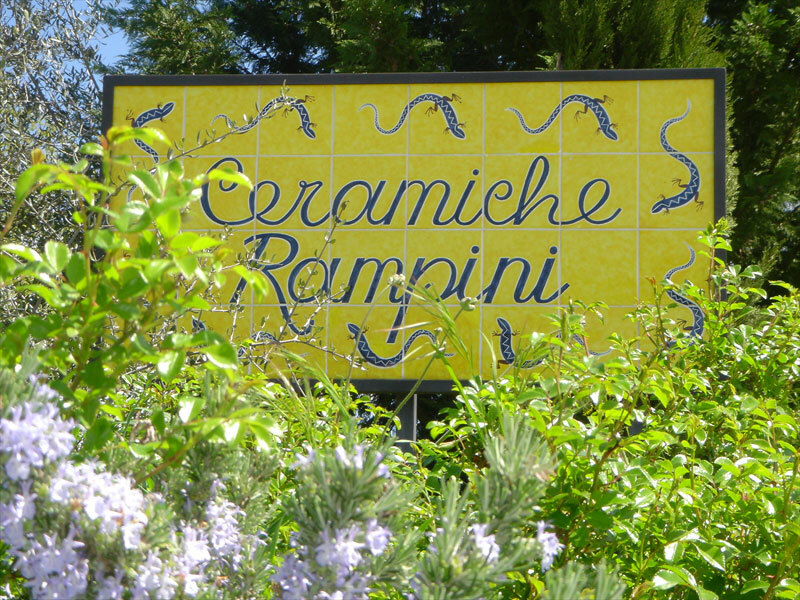 Rampini Ceramics (or Ceramiche Rampini in Italian) produces handmade and hand painted pottery in the Italian artisan tradition going back to Renaissance art and craft. Our designers unite the legacy of the Italian tradition with our love in combining and experimenting with more modern colours and designs. Our production is geared towards individual customers and their requests. Producing handmade and hand painted ceramics in the artisan tradition is a complex and slow process which requires meticulous craftsmanship just as much as individual artistic skills. 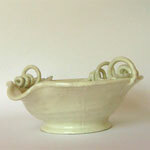 The shapes, or bisques, are shaped from clay, sun dried and fired in the kiln. Then every single piece is glazed, individually hand painted and fired for the second time. We invite you to follow this process with an especially interesting order we worked on recently. There is also a small video showing the way bisques are glazed and then painted in our workshop. We value the strength of our roots in Italian life and history, in the beauty of the Tuscan landscapes surrounding us, their flowers and animals, and in the convivial pleasure of Italian food and wines. The Chianti vineyards, olive groves and forests have been cultivated for many hundreds of years. Our designs reflect these influences. Burgundy and Rinascimento (Renaissance) for example go back to the historic role of the Medici family and there are many designs depicting grapes, olives, lemons, flowers, fruit and animals. Unusually among other Italian producers of high quality ceramics we also move into more contemporary expression of colours, designs and shapes. For us, here at Rampini Ceramics, making ceramics is a constant challenge to create, where every single brush-stroke has got its own freshness and meaning and every single piece its own uniqueness. You will be able to recognize a Rampini Ceramics object by its style, originality and quality. Rampini Ceramics was founded by the Rampini family, which originates from Gubbio, a centre of ceramics production since the 15th century. Our studio has grown since, but remains strongly grounded in the tradition of individually created ceramics pieces of high quality and artistic value. Originally, Rampini produced mainly ornamental pieces, but soon also moved into creating dinner sets and some pieces for use in the kitchen. We now offer complete lines of table and kitchenware in addition to the more traditional selection of decorative pieces. Our work offers vast choice and a high degree of individualization. We produce to order, with a range of more than one hundred different shapes from simple plates and serving pieces, jugs, bowls, jars, cups and mugs to elaborate wall plates, planters and big urns. 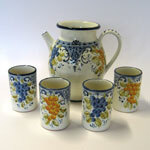 These shapes or bisques can be decorated with more than eighty different designs. Many of these designs can be combined to great effect with monocolor pieces. Beyond this existing range we are always ready to find a new or different solution according to the specific wishes of a customer - actually this is how some of our designs and some of our colour combinations were originally developed. This way of working makes it possible to customize orders with personal elements like specific designs, monograms, names, dates, family crests, logos or similar. We also create business gifts. Our workshop is situated in the Chianti, near the old town of Radda in Chianti, and is surrounded by old vineyards and woods on a beautiful hillside which is dominated by a splendid, historic villa. Here and in our shop in the centre of Florence it is possible to see and select from our creations, either to order or to buy. Our web site probably can not be able to communicate the immediate feeling of holding the real pieces in one's hand, but we hope to give an insight into the history and the intricacies of producing ceramics and to convey an impression of the richness and the beauty of our products. Enjoy! There are many ways on this site to choose pieces and designs. A special section is dedicated to decorative plates and planters and urns. From time to time our staff will make recommendations of selected sets of pieces, which can be ordered easily. At the moment this selection includes a breakfast set, a salad and a pasta set and sets of serving pieces decorated with the Burgundy and the Renaissance design. There are also several suggestions for gifts. 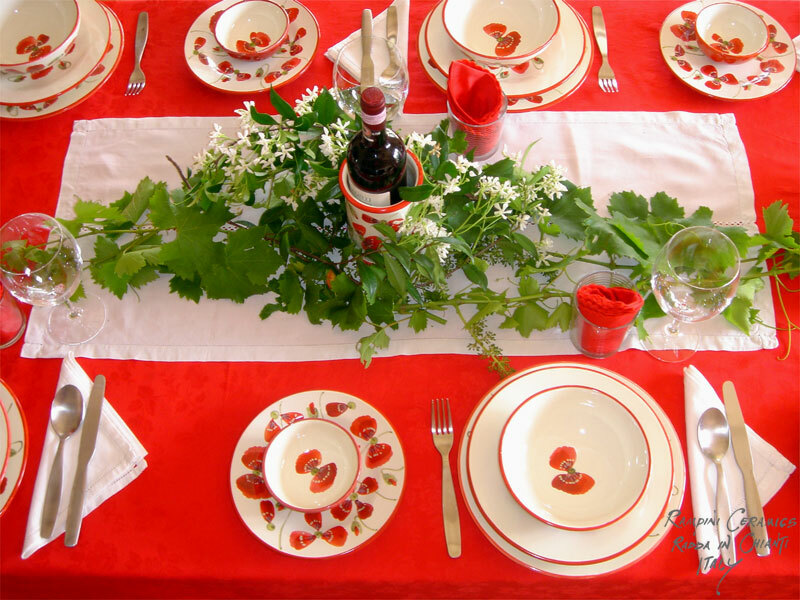 But most importantly our staff are always ready to discuss the different possibilities in composing a set of tableware or choose decorative pieces best suited for any surroundings. We welcome informal enquiries about possible orders and consider advice on choice of shapes and designs, as well as composition of sets, to be a normal part of the relationship with our customers.